An ISM volunteer was detained and threatened with deportation for participating in a peaceful, nonviolent demonstration in the village of Iraq Burin last week, and was finally released by Israel since there was no justification for her arrest or deportation. 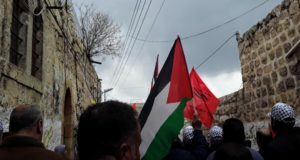 These weekly demonstrations come following the January shooting of a 19 year old Palestinian man, Oday Maher Hamza Qadous, by a member of the same illegal settlement. Saturday’s demonstration also follows an illegal nighttime raid into Iraq Burin on Thursday night–consistent with an ongoing Israeli policy of repeated incursions into the village. 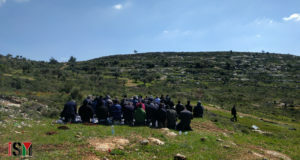 About 30 local villagers, including children, were accompanied by 3 French, 2 Swedish, 2 British, an American, and 1 Brazilian international observer during their weekly demonstration against the illegal Israeli settlement of Bracha. Local villagers and international activists were forced to flee down a steep escarpment into the valley and adjacent village, while under fire from what observers noted to be high velocity tear gas canisters according to their range, as well as rubber coated steel bullets that were shot at head height. During the attempt to escape pursuing Israeli forces, two international activists, who wish to remain anonymous, suffered minor injuries. 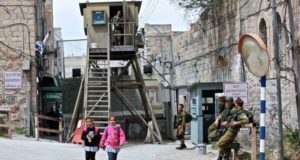 At one point Israeli forces were also seen throwing stones at a Palestinian medic after protesting their illegal and unjustified arrest of a nonviolent, international activist. The activist, from Brazil, was arrested and accused of assaulting Israeli police by throwing stones and told she was going to be taken to a court hearing on Sunday, facing possible deportation. The hearing was scheduled to take place at 8:00 Sunday morning, yet she was transported to a deportation center without hearing. A representative of the State affirmed in an informal meeting with the woman’s lawyers that she had been released around approximately 9:30 AM, while Prison Administration insisted that the activist was still in custody as of 12pm. Lawyers commented that this inconsistency opened a window for deportation police to illegally transport the woman to a deportation center without a hearing or legal consul. Lawyers commented that the woman’s illegal detention facilitated a planned deportation process. The volunteer remained in custody while lawyers petitioned the state to release her. On July 6th the court answered with a decision that the volunteer may not be deported and that the State has to respond until July 7th at 12:00 PM to the lawyers’ request to release her immediately. After waiting for the state’s response the volunteer was released yesterday without any conditions and her visa was extended for an additional week.